The Nippon Professional Baseball Organization (NPB) is Japan’s premier baseball league, and the second best league in the world (typically, it’s considered slightly tougher competition than the more familiar Triple-A level of Major League Baseball). For that reason – and the general popularity of baseball in Japan – a lot of would-be and almost big leaguers eventually get paid to extend their career overseas. But that’s not always the end of the story. Sometimes, guys perfect something about their game while earning bigger bucks in Japan, and then come back to the States to try one more time. Sometimes, it doesn’t happen, but sometimes it really works out, with Cardinals righty Miles Mikolas as a recent, perfect example. 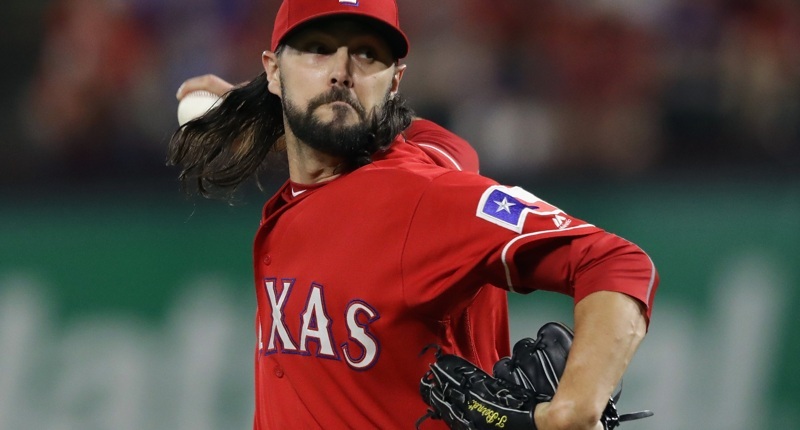 And the newest Cubs reliever, Tony Barnette, might be another. 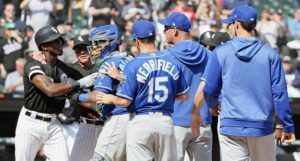 Barnette, now 35, was originally drafted by the Diamondbacks back in 2006, and stuck around for a few years, before eventually being released after the 2009 season. He made his way to Japan, first as a starter and eventually as a reliever, where he had some excellent seasons and few forgettable ones, too. 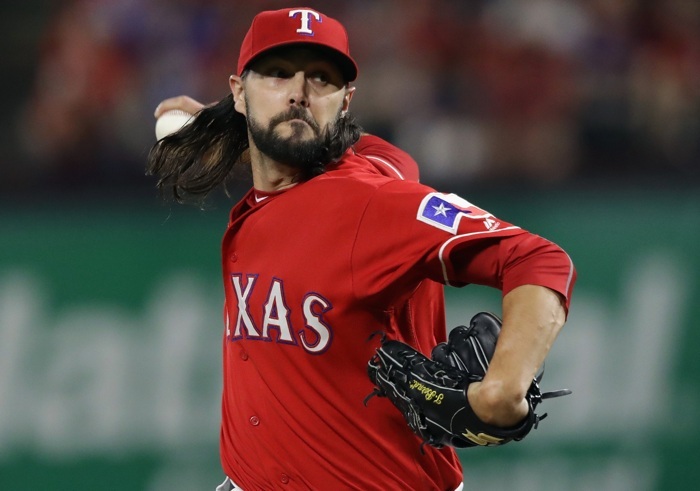 But after posting a 1.29 ERA over 62.2 innings of relief in 2015 (56 strikeouts and a 0.894 WHIP), the Texas Rangers swooped in and grabbed on a two-year contract. Barnette debuted BRILLIANTLY in the big leagues that year – at age 32 – posting a 2.09 ERA and 3.38 FIP over 60.1 innings pitched. He wasn’t really spectacular in any one area, but he did display quality control and an ability to induce some grounders and weak contact. 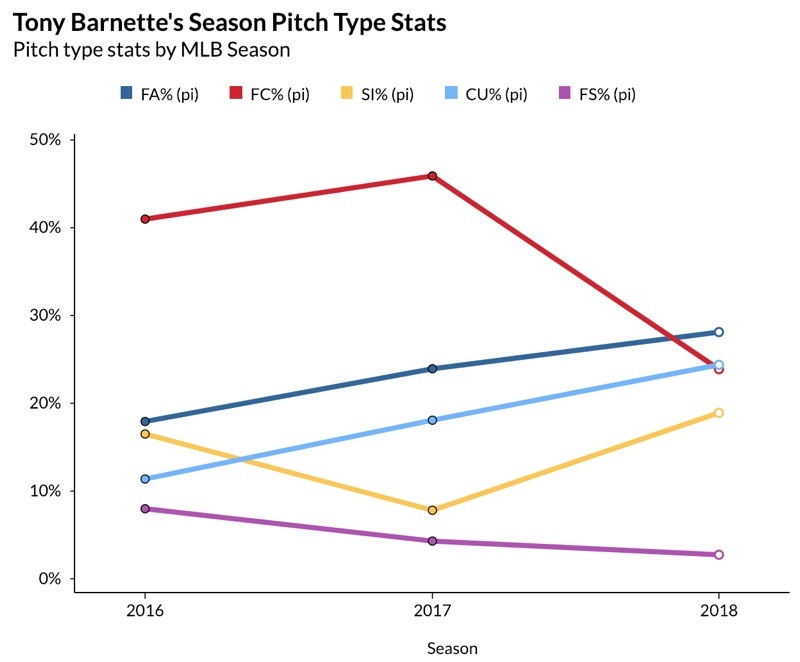 Unfortunately, Barnette was not quite able to repeat those peripherals or results a year later (5.49 ERA, 4.01 FIP in 57.1 IP during the 2017 season), but 2018 was both more recent and more impressive. Barnette’s 2018 season was interrupted by a right-shoulder strain and eventually ended by a strained lat muscle, but when he was out there (26.1 innings), he was basically better than he’d ever been: 2.39 ERA, 2.97 FIP. He maintained career bests in strikeout rate (25.0%), walk rate (4.8%), and groundball rate (51.4%). And as you can see, those aren’t just good for him numbers. Those are good, period. He did allow a lot of hard contact while also benefiting from the lowest BABIP of his career, but he also had an unusually low strand rate (especially for such a good strikeout rate), so that evens things out a bit on the “luck” side. At worst, the good outweighed the bad last season. He also used to throw a slider (4.5% in 2016), but he doesn’t as much anymore (0.8% in 2018). Perhaps there’s some correlation to his arm injury, but that would be nothing more than a guess on my part. 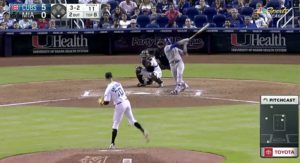 The good news, however, is that Barnette hasn’t lost a bit of velocity (93.5 MPH) since returning to the big leagues, despite his advancing age. All of which leads me to believe that if healthy, he could actually be a pretty excellent contributor out of the pen this season. Though that’s a pretty big if. Like I said, Barnette had two pretty significant injuries last season and he isn’t getting any younger. Another full year of excellent production is just not something I’d be willing to bet heavily on, which is probably why Barnette was still out there in free agency for a while, despite his performance in 2016 and 2018. 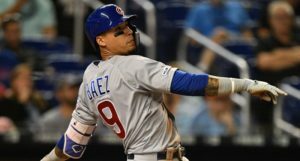 Thus, the Cubs aren’t betting too much on it – his $750K salary in 2019 is barely above the league minimum. Sure, it comes with a $250K bonus if he makes the Cubs active roster and some other kickers for days at the big league level, but it’s just a really affordable deal with hardly any risk (and it even comes with a 2020 club option). No one can tell you for certain how good (or healthy) Barnette will be this season, but he has a recent track record of high-level success, and his ceiling for this season is that of a quality reliever. I don’t think you can count on anything more than a big-league contributor, but you can hold out some hope he can be a back-end type this season. If the Cubs were going to limit their free agent expenditures to peanuts, I’m pretty glad they spent some of them on this guy.